I will be out of the office from 8/28 to 9/6 on a 'long-overdue' vacation. Finally my fiancee and I decided where to spent our vacation. We had to spent 10 days and we oscillated between Red Sea and Santo Domingo. We love sea. So, now we know : Hurghada, Red Sea - Egypt. And we chose a fantastic hotel :)) : the Oberoi. Immediately I googled it to see their site and I noticed that they published a video (a 15 secs showreel) in Flash Video format ! 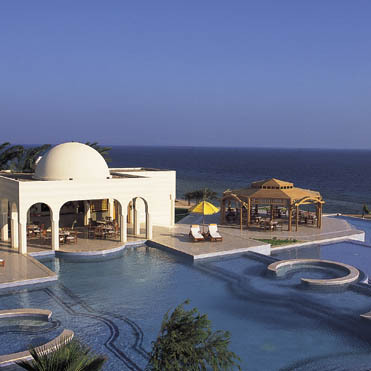 Oberoi Hotel, Sahl Hasheesh is a luxurious all-suite resort set on the coast of the Red Sea at Hurghada. With 48 acres of palm-filled grounds and 850 metres of private sandy beach, Sahl Hasheesh is a spectacular and dramatic resort. Shady marble colonnades, domed pavilions, atriums open to the sky – the elegance of the traditionally inspired contemporary Arabic architecture are a perfect complement to the setting. Unlike so many resorts, the buildings enhance the environment here. We decided to book one of 21 Superior Deluxe Suites,a spacious and elegantly with luxurious bathrooms with separate shower stalls. Their sunken marble baths overlook a private open-air walled garden. In addition, there are 12 larger Grand Suites have their own private swimming pool, heated in the cooler months. The site is very clean and easy to navigate. They had a sweet flash slideshow image gallery and a showreel video in FLV format :) Just click on Oberoi Hotel Video option. Today I received Macromedia newsletter that announce me the new issue for The Edge. I often use TaskSpy to get more control and to trace FlashLite application in runtime. 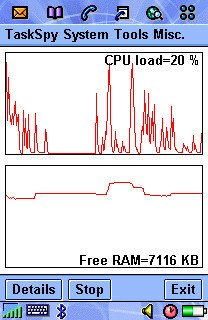 This way i can see memory usage and track cpu load. It's totally free and it's a must-have for all mobile developers ! Latest news : TaskSpy will be soon released for Series 80 and Series 90 devices. Macromedia Shockwave.com site goes mobile ! It's the japanese version of Macromedia Shockwave site dedicated to mobile stuff. You can find the most popular Flash mobile games developed with FlashLite (I suppose). Wneh can we see the original shockwave.com site with a mobile section ? Today I partecipated to the "Inside Flash 8’s New Video Features" event. It was an introduction to the ON2 codec and Flash 8 video features with Jim Phelan. I captured some of the slides of the event and convert the image to FlashPaper, download it. 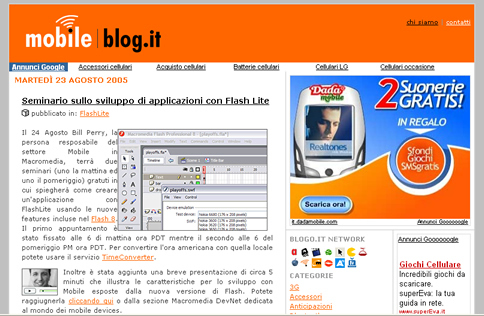 I'm one of the editor of the large and famous italian blog site dedicated to mobile MobileBlog. We created a new category for Macromedia FlashLite posts where I'll often publish news and information related to Macromedia client technology for mobile devices. Go to MobileBlog FlashLite blog or syndacate it ! Some days ago on Flash Lite Yahoo group we discussed a lot about Macromedia licensing model for Flash Lite. You can read people opinions on FlashLite Yahoo group. What do you think about Macromedia licensing model for Flash Lite ? Which is the future of Flashlite ? 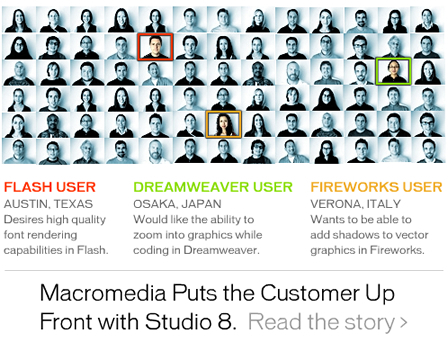 Which is the future of Macromedia Flashlite ? With my big surprise, people prefer to use FlashLite to develop application rather than games !